Oh what a lovely day! 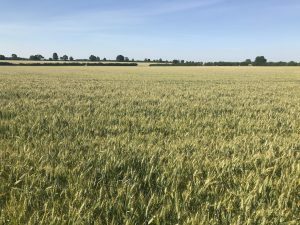 On yet another glorious (yawn) English summer’s day we found ourselves in Oxfordshire walking from somewhere to the east of Charlbury and working our way south to Oxford via Blenheim. We were joined today by Greg Trotman and Emily Repp and some of their team from Trotman Repp, a firm of US/UK tax advisors based in Oxford. 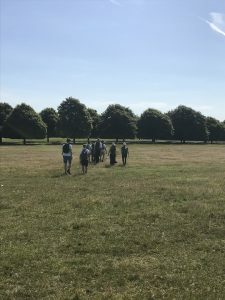 As usual we followed our pre-match routine of slathering on a good layer of sun tan lotion, checked that all of the walkers had plenty of water and set off, once again, on the Shakespeare Way. 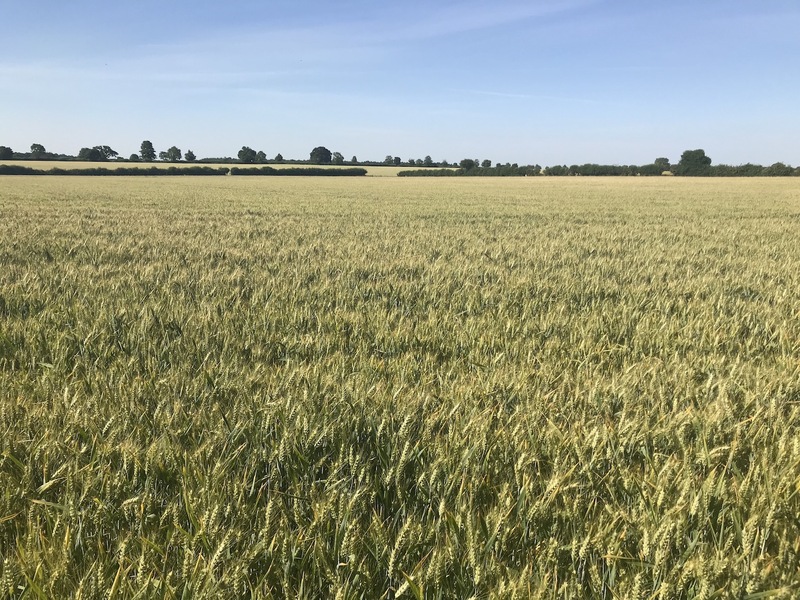 We negotiated a couple of roads busy with commuters before we started criss-crossing golden fields of barley and wheat. For the third day running we marvelled at the beauty of the English countryside. 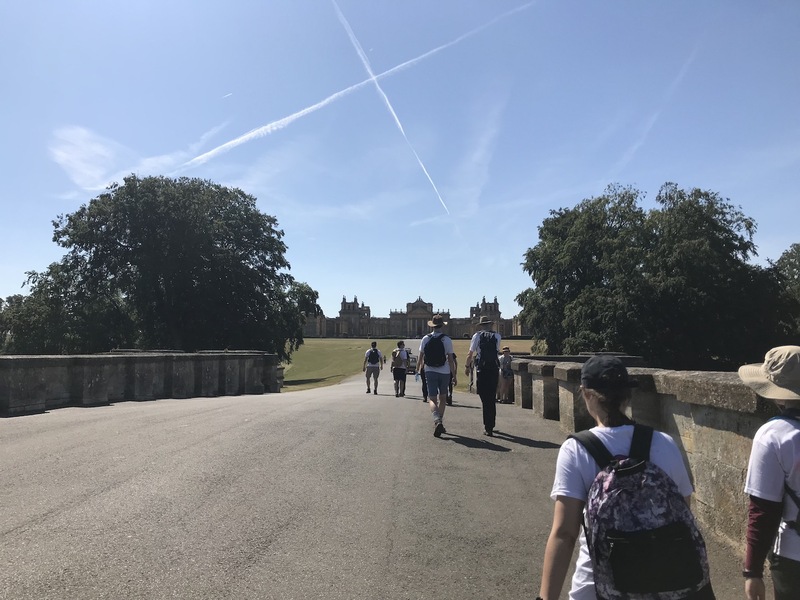 “Blenheim Palace was built in the early 18th Century to celebrate a magnificent victory over the French in the War of the Spanish Succession. It was specifically built as a gift to the 1st Duke of Marlborough, John Churchill, the military commander who led the Allied forces in the Battle of Blenheim on 13th August 1704. Following the battle, Marlborough himself received the surrender from Marshal Tallard, leader of the French forces, following the battle. 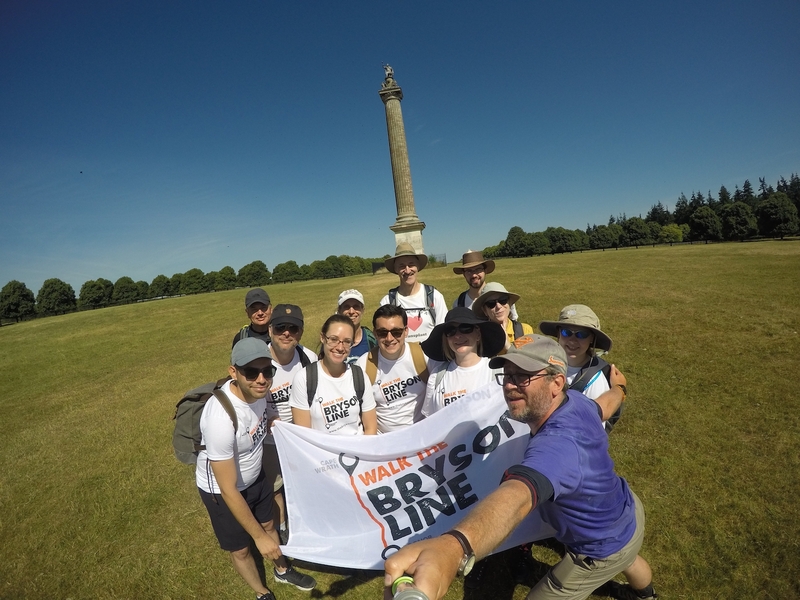 We walked across parkland owned by the Duke of Marlborough, the vista dominated by the Column of Victory. This stands at 134 feet high and is crowned by a lead statue of the 1st Duke of Marlborough which depicts him dressed as a Roman general! This was a no-brainer for our daily Flag Picture. 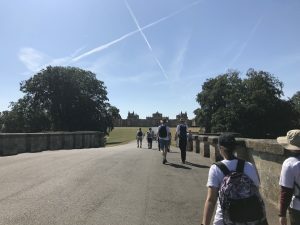 We left Blenheim via the Woodstock Gate walking straight into Woodstock, a charming village of yellow Cotswold stone and then on to Bladon and Yarnton where we found shade and a breeze outside Yarnton Manor International Study Centre. 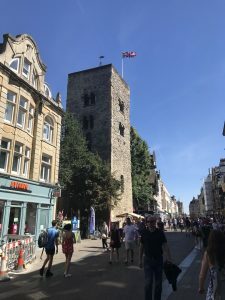 Here we sat with our backs to a stone wall, drinking in the cooling breeze. But not for long though. We have made an effort over the Walk to not spend too long sitting around. The longer one sits, the harder it is to get up and get walking again. 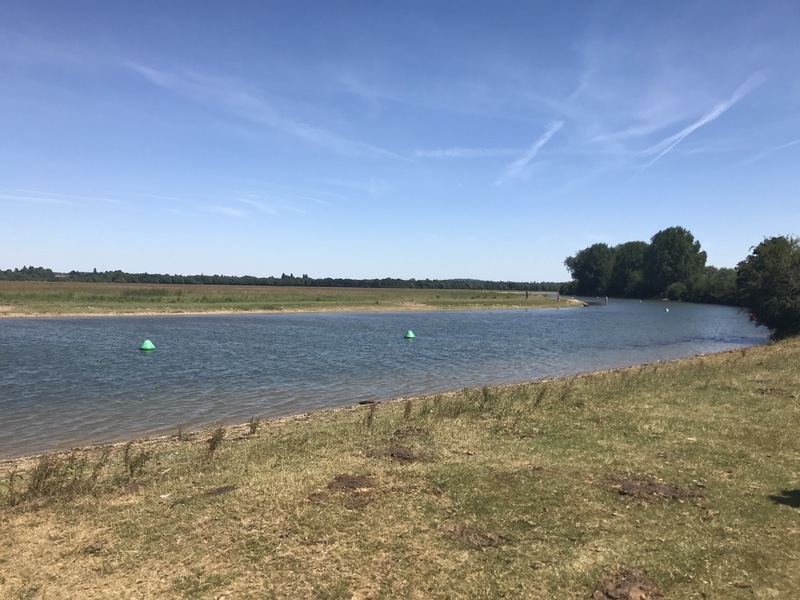 The second part of our day saw us back on a canal path and then following the Thames across the gorgeous Port Meadow into Oxford. 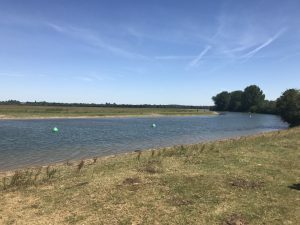 With a lot of kids having finished exams and therefore school, Port Meadow was littered with small groups sunbathing and swimming in the Thames. Oh the temptation to join them. The water looked so cool and refreshing! We stiffened our resolve, tightened our girdles and carried on, briefly stopping to refill water bottles at the Perch. 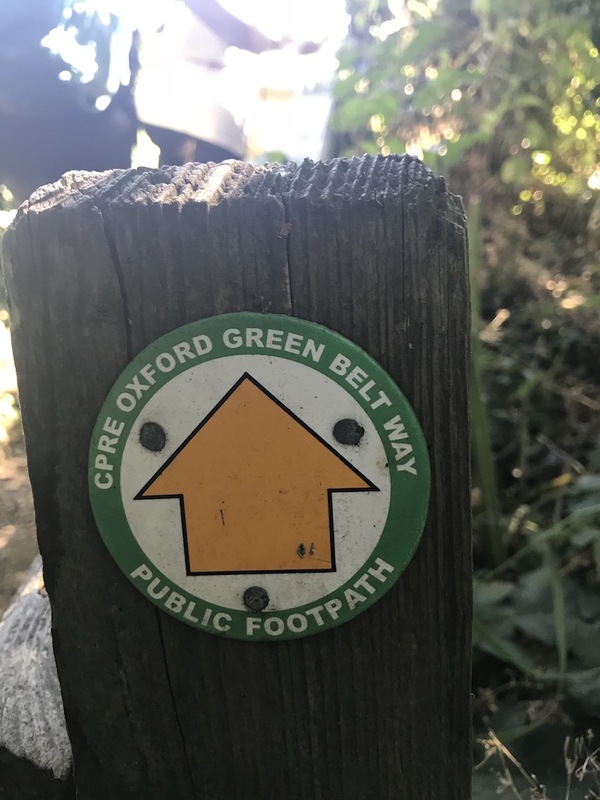 Finally, arriving in Oxford we elected to walk straight to a pub where we enjoyed some very refreshing ales after another long, hot day. 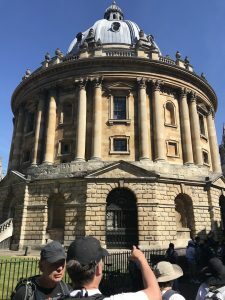 As we entered Oxford, the first large urban area we had been in since Inverness on Day 4, it really did feel like we were returning to Civilisation, really quite appropriate. Thanks to Greg, Emily and their team for being wonderful and engaging hosts and sharing their special part of Oxfordshire with some tired walkers.